This elegant piece of the Colony fixture collection boasts a unique ability to complement any decor, be it classic, modern, or even something of your own particular taste. The finish of this complete fixture set has a soft metal finish, and will easily install to provide you with the quickest gateway to a luxurious bathing experience. Also available in store by special order only see store for details. The Brantford Single-Handle PosiTemp Valve Trim Kit from MOEN makes it easy to polish off your shower install or renovation. With traditional styling and a sparkling chrome finish, this lever and escutcheon will instantly upgrade your bathroom aesthetic. It fits onto a compatible PosiTemp pressure-balancing valve, letting you dial in your desired water temperature by rotating the handle through a 270-degree arc. Part of the M-PACT common valve system, this set makes it simple to substitute the trim pieces without tweaking the plumbing should your future style preference change. Backed by a lifetime limited residential warranty, it features metal construction for decades of dependable use. This trim kit requires MOEN valve 2510, 2520, 2570 or 2590 (not included) to complete installation. Washing Machine Connector Kit Washing Machine Connector Kit includes 5ft washing machine Flex-Connect Stainless Steel braided supply with chrome plate elbows. Two sealing washers are supplied with the water inlet hoses to prevent water leaks. To be used with water in accessible locations only, in order to avoid stress on the connectors. Washing Machine Connector Kit is rated 1.0 out of 5 by 2. Rated 1 out of 5 by Hogtown from Waste of Money I do not recommend buying these hoses. I wanted good quality, but these hoses cannot fit on normal indoor taps. Water leaks as it can't create a proper seal. Rated 1 out of 5 by JeffV from Useless product This particular set of hoses is not worth your time as they do not come with a thick enough washer to seat properly with the supply side piping. Will seat fine with the thin walled supply hookup on the washer but the design does not work for the house side of your plumbing. 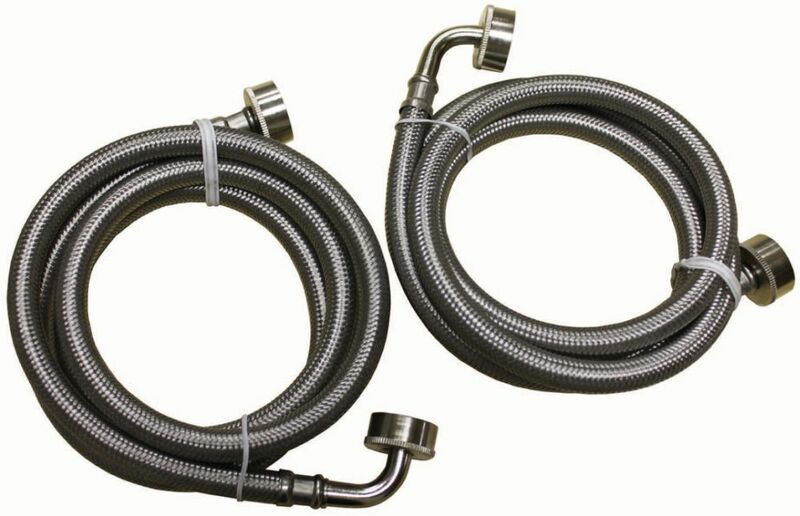 Buy the single hose x 2 for your hookups or go to a plumbing supply store. Needless to say I'm returning it.